Fisherman’s Grits Bowl: bulgur grits with kale, confit salmon, fermented greens, grapefruit fennel, cracked amaranth, curtido, sesame, and a poached egg. It has been a long time since I have posted anything. Life got busy, and then I was diagnosed with Multiple Sclerosis which resulted in some significant dietary changes. I no longer eat red meat, dairy, white flour or white rice products or sugar. I do eat a lot of fruits, vegetables, legumes, fish, poultry, and whole grains. My “cheats” are treats made with sugars like maple syrup, coconut sugar, or honey, and the occasional alcoholic beverage. My husband has been eating this way to lower his cholesterol naturally for years, so the transition wasn’t too bad. If anything, it has made cooking more fun, because I love food and I like a challenge. And it is working for me so far; in some ways I feel better than ever because I am eating so well. I will write more about this when I post some of my favorite new recipes, but I don’t want to get sidetracked. Our family spent a month in New Zealand, Australia, and Vanuatu over the summer and I want to post some of my favorite meals from that trip. 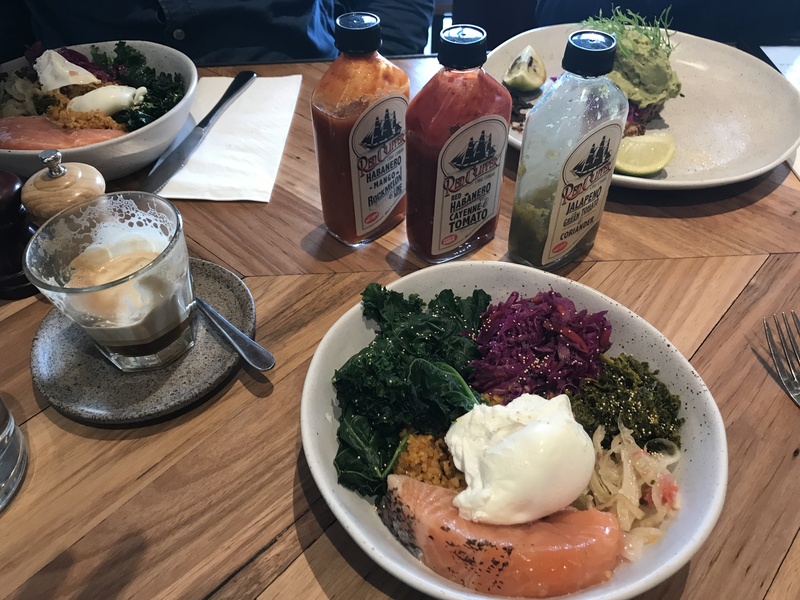 The first of these is this healthy and delicious Fisherman’s Bowl from Bondi Hall in the Sydney beautiful suburb known as Bondi Beach. 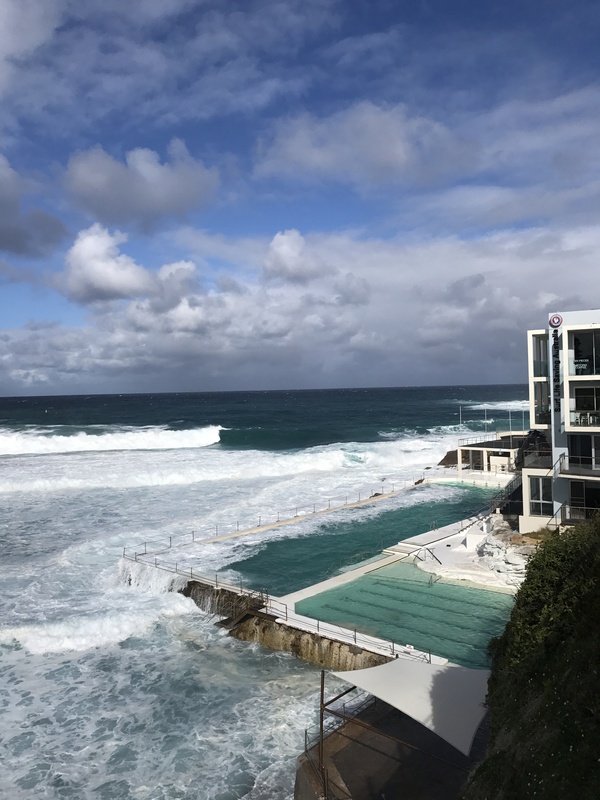 I wish the Chicago suburbs looked like Bondi Beach, which is a gorgeous beach town and home of the best swimming pool I have ever seen, the Bondi Icebergs (which I can’t help but post a photograph of here). Bondi Hall is a lovely little cafe that was opened by the Reuben Hills and Paramount Coffee Project team, well-known for their delicious coffee. They also have some very nice menu items, including a great avocado toast. Whenever I travel, I like to try to recreate some of my favorite dishes and this bowl was one of the main inspirations I brought back from Australia. I especially like the inclusion of curtido, a Salvadoran pickled cabbage slaw traditionally served with pupusas. Somewhat reminiscent of the ubiquitous poke bowl (which I am a big fan of, but which has recently given rise to many disappointing adaptations in restaurants all over the US in my opinion), this bowl is a healthy, hearty, and yummy mix of flavors and textures. It is served with an array of hot sauces, thus hitting all the marks for me; I don’t think you can go wrong with a healthy dish that includes something pickled, something spicy, and is topped with an egg.